In June 2007, the coastal population of the Taihu Lake, in the Jiangsu province, woke up to a dreadful scene. China’s third largest freshwater lake had turned green. A thick cover of algae covered the entire lake, affecting the water resource of over 2 million people living on its shores. 12 years later, the problem has not been totally solved. What had caused this strange phenomenon? Eutrophication. You might not have heard of it, but eutrophication is an important environmental issue. This process is the result of excessive flows of nutrients such as nitrates and phosphates entering freshwater, thus causing an algal bloom that removes oxygen and affects water quality, causing death of fish and other organisms. And guess where these nutrients are found? Detergents. Laundry and dishwashing is such a major part of our daily lives, we often forget the environmental cost of our cleaning habits. Nevertheless, the detergents you use to make your clothes shine are highly polluting. And nutrients are just one among the various chemicals responsible. With a growing world population, this environmental threat is likely to increase. Ocean&Forest, a Chinese company, was founded by Dakai Zhou in 2014 to tackle this issue. After over 3 years of research, he developed a detergent both harmless to the environment and to humans. “When I was a child, I could drink fresh groundwater but now the tap water is completely unfit for drinking” recalls Zhou. “China now uses 609 billion tons of water every year and emits 74 billion tons of wastewater. There is huge pollution in this discharge, which is increasingly damaging our environment”. Ocean&Forest’s formula is made from oxygen, renewable plant extracts and food grade ingredients, making their detergents 99.7% degradable in only 7 days. “Through a process, we combine oxygen and soda to make solid oxygenous particles. This kind of raw material releases only water, soda and oxygen in water, so there are no other additives and impurities. In order to achieve better washing results, we also added some plant extracts to help increase the washing effect, such as lemon extract, palm fruit extract, baking soda and biological enzymes. 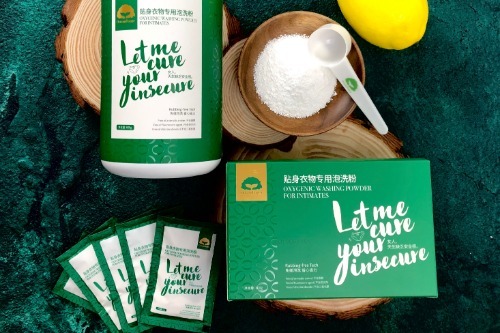 These additives are all biological sources and can be degraded by themselves, so they are very safe to humans and very friendly to the environment” explains Dakai Zhou. Not only is Ocean&Forest detergents much more eco-friendly than its chemical counterparts, they also reduce the amount of water needed to clean the clothes. Mostly, because of its all-in-one function and the very low amount of chemical additives they use. Surely, you want your laundry and dishwashing to have the lowest environmental impact possible. However, you still need those nasty stains to go away. According to Dakai Zhou, both are totally compatible: “The actual use and testing of our products has even exceeded the current (traditional) products made with chemicals. In terms of washing power alone, the decontamination power of our products is more than twice the decontamination requirement of China's national standards”. Soon after their commercialisation, this sustainable detergent solution experienced rapid sales growth in a country which is becoming ever more conscious of its impact on the environment. “Chinese consumers and governments are increasingly aware of the seriousness of the environmental problem, so everyone’s awareness of environmental protection is awakening” says Dakai. The entrepreneur has been invited in over 100 media channels. “We believe that 2019 is the year we emerge as a superstar in the market!”. Alongside entrepreneurs such as Zhou, governments also have a crucial role to play to fight eutrophication and incentivise cleaner domestic products. All 50 U.S States have banned phosphorus from laundry detergent, and the EU has imposed a strict limit of 0.5 grams per washing load. In China, the Jiangsu province authorities have forced many chemical and manufacturing plants near the lake to relocate, have installed sewage treatment facilities and have invested massively to clean-up the lake. Finally, birds and fish are coming back to Lake Taihu. Looking at its high environmental and economic impact, the fact that Ocean&Forest were granted the Solar Impulse Efficient Solution Label is no surprise. But we are also particularly thrilled as they are officially the first Chinese solution to be part of our portfolio. Being one of the fastest growing cleantech ecosystems in the world, China is naturally becoming a strong focus in our selection of 1000 clean, efficient and profitable solutions. The labelling of Ocean&Forest is the result of a network collaboration with UCommune, one of the most influential coworking space provider in China, which has been key to the development of Ocean&Forest, and many eminent startups such as Mobike. “The Solar Impulse Efficient Solution Label is very meaningful to us because it proves that we do not stand alone in our mission to protect the environment. The Solar Impulse Foundation has opened up our horizons to new opportunities, allowing us to extend our focus from a domestic to an international market environment”. Previous article Guest Post: "Five ways the travel industry is becoming more eco-friendly"